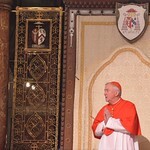 Cardinal Vincent has sent a message to the annual Anglophone Safeguarding Conference currently underway in Rome. He stresses that although much has been done, there's much more to do ‘in both the prevention and response to this crime’. The Rt Revd Marcus Stock, Bishop of Leeds and Vice Chair of the National Catholic Safeguarding Commission, delivered the message to delegates at the event that runs from 20 from 23 June and is jointly hosted by the Catholic Bishops' Conference of England and Wales and Kenya's Conference of Catholic Bishops. The Anglophone Safeguarding Conference, this year exploring the simple yet important theme of 'Listening', provides a forum for the ongoing development of strategy and good practice in the vital area of safeguarding children and vulnerable adults in the Catholic Church.